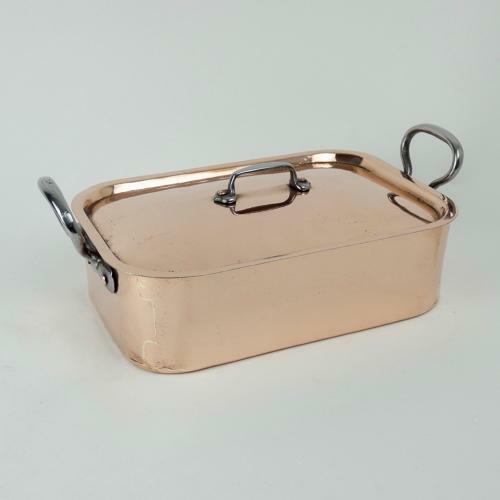 An unusual shaped, French copper, lidded casserole. This piece is made from a heavy gauge of copper and it has castellated seams around the base and up the side. It dates from c. 1870. The steel handles are the typical French shape and these are attached to the pan with copper rivets. This could be used either as a casserole or as a deep baking dish. The pan is 30.5cm. long by 21cm. wide by 9cm. deep. Overall, including the handles and lid, it is 38cm. long by 22.5cm. wide by 14.2cm. high. It is in excellent condition and the interior has been re-tinned so that it can be used. Price includes postage with in the U.K. and Western Europe. Shipping to the U.S.A. add £25.